On June 5, the MONKEY BIZ II weighed in Konas first grander of 2009. Capt. Chip Van Mols and mate Ryan O'Hallaran hosted Ryan's father, Tim O'Hallaran, on a full-day fishing trip. 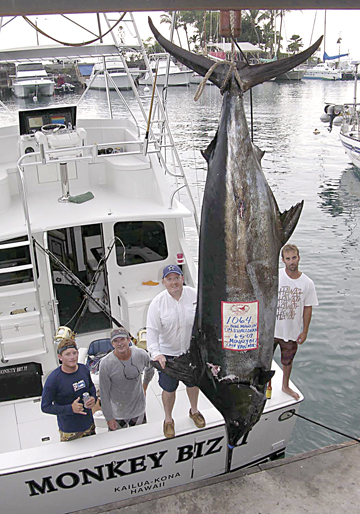 At around 3:45 p.m. they were just outside the harbor, when the marlin hit. Tim wrestled the fish to leader in 15 minutes.